Santa Fe is a city bursting with energy. Everywhere you look you can see the cultural influences from Adobe buildings to street markets filled with homemade goods. You can spend hours exploring this incredible city as you browse through shops and try out the local cuisine. As you get further from the city, the landscape broadens into desert surrounded by mountains. To explore this incredible area, try some horseback riding in Santa Fe! Explore the wild and venture through a variety of landscapes on saddleback. 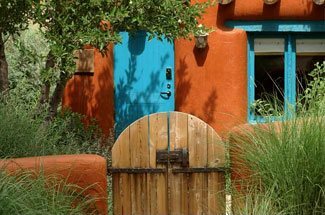 If you’re planning a trip to Santa Fe, take advantage of our free Vacation Guide. Planning a vacation can be hard, so Four Kachinas has narrowed down our favorite things to do in the area to save you from hours of research. Skip the tedious part of preparations and use our free guide to find everything from the best golf courses around to fun activities like horseback riding in Santa Fe! Head out along the Turquoise Trail while horseback riding in Santa Fe! With Santa Fe Western Adventures, you will embark on a one-hour journey from the company’s private ranch. With varied terrain and gorgeous views, you won’t be disappointed! The Sunset Ride will feature a short hike up the historic landmark Lone Butte Mountain for an unobstructed view of the sky! When deciding on a company to go horseback riding in Santa Fe with, Broken Saddle Riding Co is a premier choice. This company offers knowledgeable tour guides, memorable experiences, and absolutely gorgeous trails. The horses are well cared for and the landscape is beautiful. Enjoy morning rides in pristine weather and canter through the canyons! Desert views, mountain scares, and forest trails all await at Broken Saddle Riding Co! Lone Butte Ranch is another great place to go horseback riding in Santa Fe. The guides at this company offer detailed instruction and guidance on a network of trails. Here, you will experience both entertainment and beautiful views! Brushy trails and hills await on your sunset ride. Enjoy the serenity as you ride through nature toward the golden glow of the sky. As the sun sinks down to the horizon, you will head back to the ranch and end your journey with the end rays of sun streaming across the atmosphere. After a day of fun horseback riding in Santa Fe, you will be so excited to come back and relax at Four Kachinas. 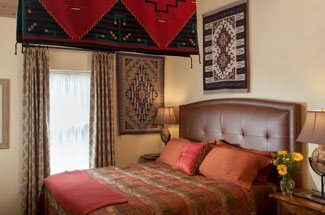 Choose from any of our cozy rooms to delight your senses and ensure a comfortable, relaxing stay in Santa Fe. You can spend the night relaxing in comfort, or enjoy the outdoors a little more in our garden courtyard! Many of our rooms have private patios and entrances, and all guests have access to our breakfast room and lounge. Our breakfast room features complimentary baked goods, soft drinks, water, tea, and coffee, plus a homemade buffet-style breakfast each morning! What are you waiting for? Book your stay today!